Aggressive drivers not only add stress to your work commute, but they also increase your risk of being in a serious car accident. The New Hampshire car accident attorneys of Tenn And Tenn, P.A., have years of experience litigating auto accident cases oh behalf of injured New Hampshire residents. If you have been injured in a car wreck caused by an aggressive driver, one of our experienced attorneys can evaluate your case and talk with you about your options for seeking compensation. Speeding or otherwise driving aggressively is one of the leading causes of accidents both across the United States and in New Hampshire. According to the National Highway Traffic Safety Administration, there are about 40 fatal accidents attributed to speeding each year in New Hampshire. This number does not account for accidents related to following too closely, cutting off other drivers, or other forms of aggressive driving. If a person is injured in an accident caused by an aggressive driver, the injured person can potentially collect compensation for his or her injuries. The plaintiff’s injuries were caused by the aggressive driver’s actions. All drivers owe a duty to other drivers and motorcyclists to drive reasonably given the circumstances. An aggressive driver whose tailgating or weaving in and out of traffic causes an accident has generally breached that duty. If the accident causes injuries to another person, the aggressive driver can be held liable under New Hampshire law. Even if the injured driver was partly at fault for the accident, the case may still be viable. New Hampshire allows plaintiffs who are less than 50 percent responsible for the accident to collect a portion of their damages. Ask an experienced attorney about the particular circumstances of your case and whether you are able to seek compensation. Once the plaintiff proves that the aggressive driver was both negligent and the cause of the injuries at issue, the plaintiff is entitled to damages. The victims of an aggressive driver can recoup the quantifiable costs of the accident, such as medical bills, lost wages, and personal property damage. These are called economic compensatory damages. Plaintiffs may also collect noneconomic damages, which compensate for things like emotional distress or pain and suffering. A knowledgeable attorney can help you determine what kinds of damages you may be entitled to. 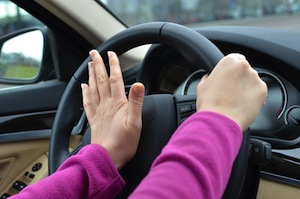 Aggressive drivers endanger themselves and the drivers around them. If you have been injured by an aggressive driver, the law gives you a right to pursue compensation for your injuries. Contact Tenn And Tenn, P.A. to speak with one of our experienced New Hampshire car accident attorneys, who can inform you of your legal rights. Call us at (603) 624-3700 or fill out our online contact form to schedule your free consultation.